Last week I got to photograph the Warped Tour for the first time with Born Cages, an awesome band based out of New Jersey. We worked together once before when the guys were in Richmond and some of the pictures ended up being printed inside of the hard copy for their album. After a 2 hour drive to VA Beach, I picked up my press credentials and started figuring out my schedule for the day of bands to shoot. I'd been in touch with a few other acts' press contacts and needed to figure out when and where I needed to be for the bands I'd committed to. You can buy a schedule for $2 but I didn't have any cash on me (I later learned this was a mistake) but I was able to take a picture of the schedule with my phone. Born Cages weren't on until 6:15 and I had some time to kill before I had to shoot so I went back into the catering area to grab a bite to eat. The line for catering was super long so I left to go explore the festival. Senses Fail were about to play so I headed over to their pit. 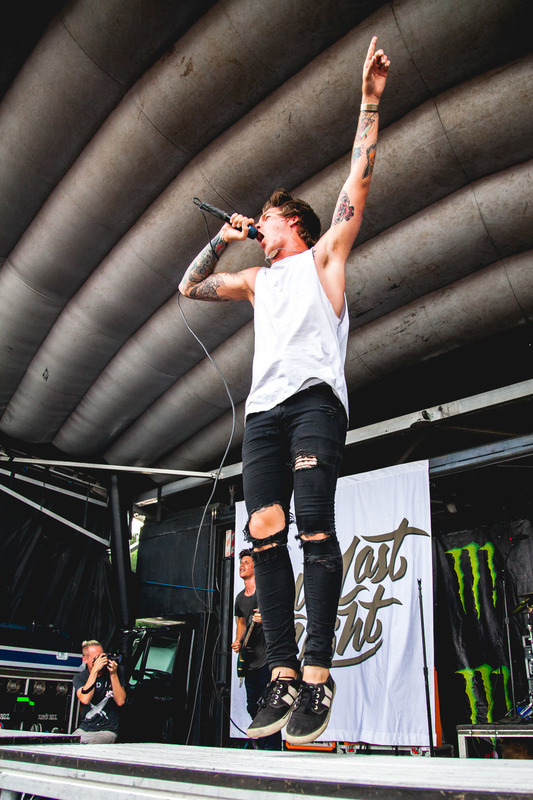 One of the coolest parts about Warped is that you can just walk up to any stage and shoot for the first 3 songs. Buddy Nielsen, their lead singer, is really active on stage and started doing one armed pushups right in front of me at one point. The crowd loved it. After Senses Fail, I completely forgot about eating and went to the main stage for Miss May I. The photo pit was a lot more crowded over there, especially with all the security guards in place to catch crowd surfers who came flying over the barrier. 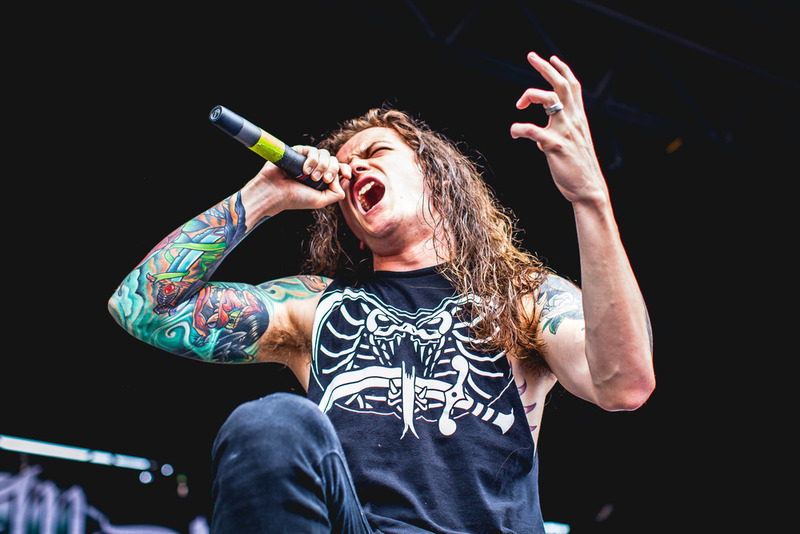 I don't really know much about Miss May I's music but they move around a lot on stage and were fun to shoot. At one point Levi Benton, the lead singer, jumped off the speaker stack and climbed the crowd barrier right in front of me. I had a fisheye on my nikon so I grabbed that and snapped a few hail mary shots. The fisheye I have is pretty cheap and the screws in it keep coming loose so pretty much had to hold the lens together while I was shooting. Not too bad for a lens that's falling apart. I walked around a bit more after Miss May I's set and got pretty dehydrated so I figured I'd check out catering again. The line was just as long but I needed to get some water and sit down for a minute so I stuck it out. Most of the other people in line were in bands and I started talking to a cool couple behind me from Boston. Turns out one of them was the lead singer of Transit and, when we finally got inside and I didn't have any cash to pay for the food, his girlfriend spotted me the money until I could go to an ATM. They're both really awesome people and I was super grateful not to stand in line again for another hour. Transit plays an electric and an acoustic set everyday so I told them I'd come by and photograph the acoustic set that afternoon. Transit on the Acoustic Basement stage. I also met up with Vlad, Matt, and Dave from Born Cages in catering and decided to stick with them for a bit and shoot some candids. 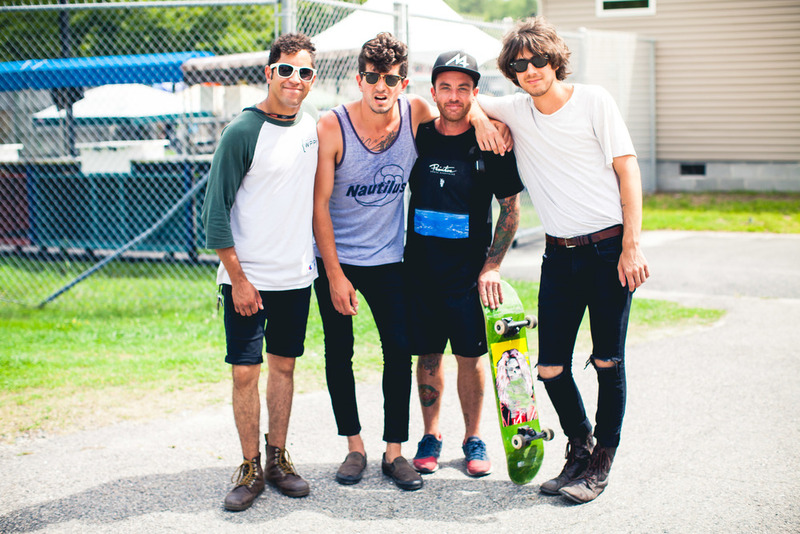 They're all really nice guys and were cool with me photographing pretty much everything. We went back to their bus, which they were sharing with Our Last Night, so I got to meet the band before shooting their set later in the day. Born Cages had to leave for an interview so I went to shoot some of the other bands I'd committed to. This post is getting pretty long so I'l condense the rest of the day to just the highlights. In between sets, one of my earplugs fell out of my pocket and bounced under a chain link fence. I have ACS molded earplugs, which I absolutely love, and I was not about to lose one. The plug was just out of my reach so I spent 5 minutes on my hands and knees trying to inch it closer with a flyer I found on the ground. It felt like that scene in Pirates of The Caribbean where the prisoners are trying to coax the dog holding the keys closer. I finally managed to recover my earplug and continue shooting. 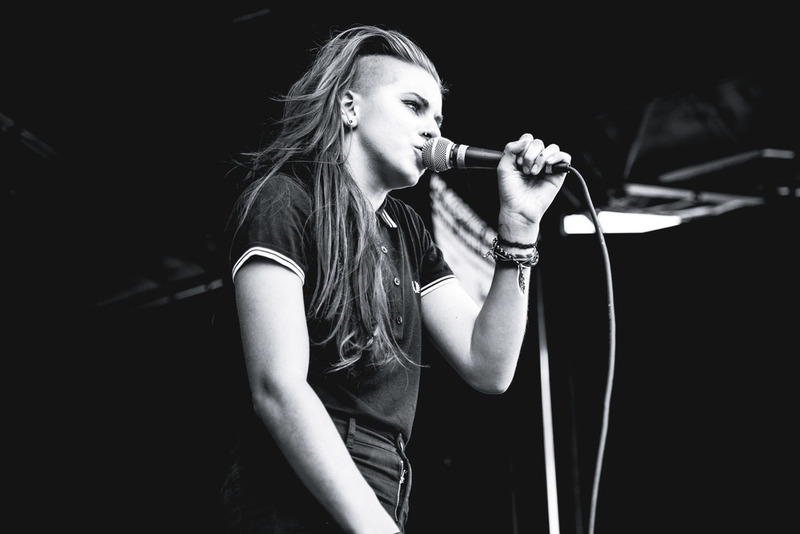 I was really stoked to photograph PVRIS, and it turned out every other photographer on Warped Tour was too. The pit was nuts for their set but I ran into Adam Elmakias which was cool. We tried taking a picture together later but the focus missed both times. So now I have a 2 blurry pictures with Adam which is kind of embarrassing especially since he just posted this. View from the photo pit for PVRIS. Our Last Night went on just as it started to rain but that didn't deter their fans at all. Their set was incredible and loads of fun to photograph. Afterwards, I ran over to the Beatport stage for Born Cages. The guys crushed it and made a bunch of new fans who lined up by their merch tent to get shirts, posters, CDs, and these rad Born Cages lollypops. If you're attending the tour this year, I highly recommend stopping by the Beatport stage for their set. 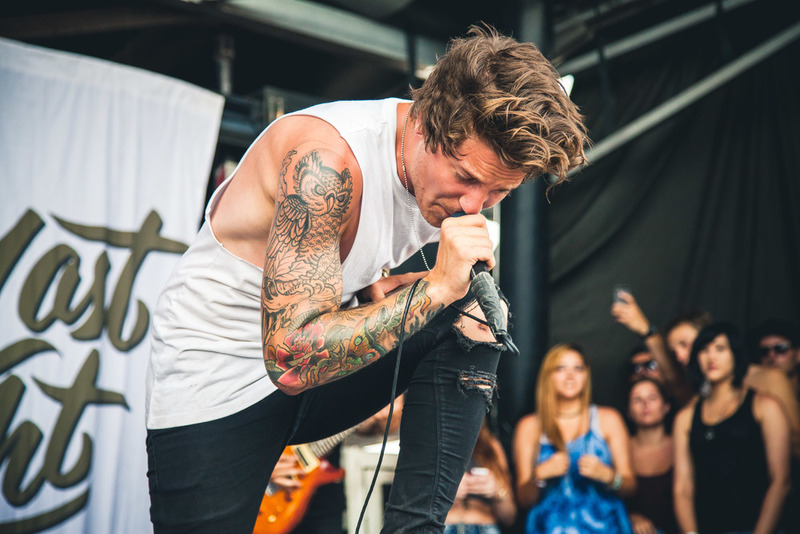 I wasn't sure what to expect from my first Warped Tour but I ended up loving it. Everyone was super friendly and supportive and there is so much going on to photograph. Thanks for sticking with me if you've read this far. I know this was a really long post so here are some more pictures.